Sometimes we can all take life – and ourselves – a little seriously. I don’t know about you, but I need a little fun. Why not start with your fashion? After all, half of it is dressing the part, i’nnit? Fancy that! 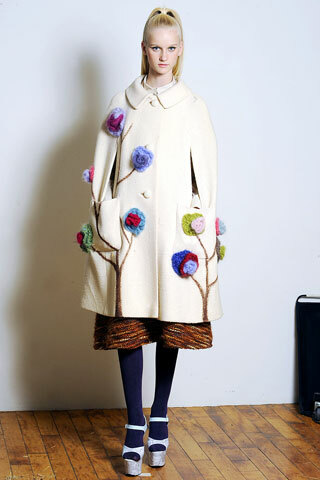 Libertine FW09 floral coat. My quest for frivolity led me to these gorgeous pieces from Libertine – the label known for mixing up the unexpected. They first caught my eye several years back when they silk-screened a pink floral pattern on a grey tweed suit. I had never seen anything like it. The tweed silk-screened suit from the FW04 collection. Johnson Hartig (with partner Cindy Greene) leapt over mainstream fashion barriers by using recycled clothing…then he deconstructed classic, tailored pieces and added graphics for a completely unexpected, clear your throat (a-a-ahem) approach to dressing. The latest collection for FW09 is true to his tongue-in-chic form and throws in a little Anglomania – something that is always welcome in my closet. Loved seeing this proper coat that HRH herself might wear - with an image of Her Majesty screened on. What a scream. Men can get in on the act, too. 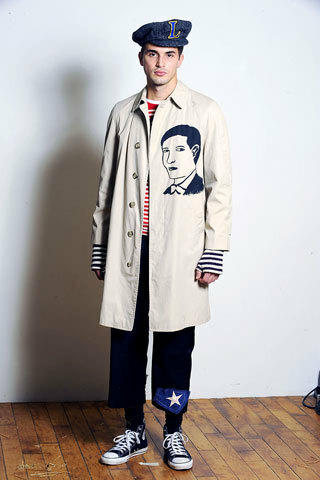 I loved this men’s trench with Liz screened over the wearer’s heart. Cheeky. It would look amazing over a slim suit/skinny tie combination. Why should the girls have all the fun? 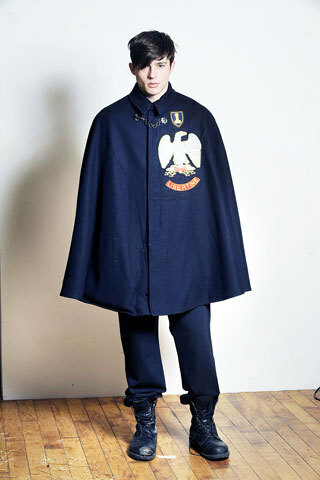 Libertine men's coat from FW09. The caped crusader at Libertine. The caped crusader look can’t be pulled off by everyone, but I enjoyed the Brit historical references – you can see a bit of the Edwardian period in this and proper boys’ school attire, but also the glory days of punk on the King’s Road with those combat boots. …just in time for the New Year. I've always loved this layered and cozy men's look. Here’s to laughing at ourselves a little more, having a lot more fun and to not-so-plain loosening up. Who says fashion is faceless? Okay, this one is on my wish list, aussi. Shake up the winter blahs with this Libertine fun-fest coat. Ok, let's have some serious fun! Cheers for the nudge, Johnson.